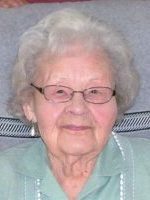 Berniece Burchett of Otsego, MI passed away Tuesday, November 20, 2018 in Otsego. Berniece was born November 14, 1918 in Monterey Twp., Allegan Co., Michigan the daughter of Nick and Anna (Brenner) Boerman. She was a beautiful seamstress and made clothing for her children and herself. She enjoyed doing volunteer work including den mother for scouts, band boosters and the Apple Dumpling Gang at the Otsego United Methodist Church of which she was a member. She also enjoyed summers at Crooked Lake and traveling. Her family was very important to her and very supportive. She was a wonderful mother and she enjoyed an abundance of visitors during her stay at Vicinia Gardens. On May 16, 1936 in Goshen, IN she married Loren Burchett who preceded her in death in 1997. Berniece is survived by her children, Stan (Charlotte) Burchett of Kalamazoo, Sandra Morey of Plainwell and Barbara (Bob) Fuller of Otsego; daughter-in-law, JoAnn Burchett; 9 grandchildren; several great-grandchildren and great-great-grandchildren. She was preceded in death by her husband, her son Dan and her siblings Donald and Jean and her son-in-law Mick Morey. Those desiring may make memorial contributions to Kellogg Eye Center or to the Otsego United Methodist Church. Sorry to hear of the passing of your Mother. Sandy and I will be in prayer for you and your family. May the God of all comfort be your strength during this time.